Description: Our mix makes an authentic savory salsa with onions, red & green bell peppers, garlic, and Tex-Mex herbs & spices. We've made it super-hot by adding Ghost Pepper (the 3rd hottest on the planet) and extra garlic for a spicy salsa experience. 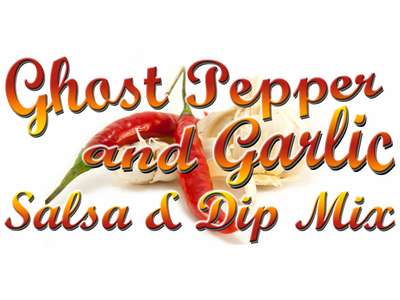 Ingredients: salsa base (onion, red & green bell peppers, garlic, herbs & spices, chili powder) sea salt, ghost pepper, garlic. Packaged in a facility that handles wheat, milk, soy, egg, peanuts, and tree nuts.